McLaren GT has today confirmed that it will premiere its latest model at this year’s Pebble Beach Concours d’Elegance, with the wraps set to come off the track-only 650S Sprint. The stripped-out racer will make its global debut alongside a number of other models from McLaren Automotive, and completes the brand’s display with four global debuts planned for the Californian event, including the McLaren P1 GTR. Based on the recently launched McLaren 650S Coupe, the track-focused 650S Sprint is fitted with developments to the Brake Steer system, even more refined active aerodynamics and a race set-up for the ProActive Chassis Control (PCC). These upgrades deliver a more engaging GT racing experience, without losing any of the refinement and balance found in the road car. As with the 650S, the aerodynamically optimised design of the 650S Sprint offers increased levels of downforce, and the revised air intakes carried across from the road car allow for optimised cooling of the 3.8-litre twin-turbo M838T engine. In the 650S Sprint, the proven powerplant is retained from the 650S roadcar, with a unique engine and transmission calibration to further enhance on-track drivability and driver engagement. The cabin is fully track-focused and stripped out to minimise weight, but with no compromise to driver safety or comfort. Built around the lightweight and inherently strong carbon fibre MonoCell chassis, the interior also features an FIA-approved rollcage to further cocoon the driver. A lightweight carbon fibre HANS-approved racing seat, with full six-point harness, offers an optimised driving position, while an air-conditioning system is retained adding comfort. An integrated fire extinguisher system is also installed. McLaren GT recently announced the 650S GT3 race car, which will be seen on the grid from next season, and the 650S Sprint shares a number of design features with its bigger brother. A larger motorsport fuel ‘bag’ tank with quick-fill connectors is added, as is optimised cooling through the larger GT3-developed front radiator with a GT3-inspired bonnet integrating radiator exit ducts, and the addition details on Autoreleased from the front wings louvres to further optimise airflow over, and around, the bodywork. 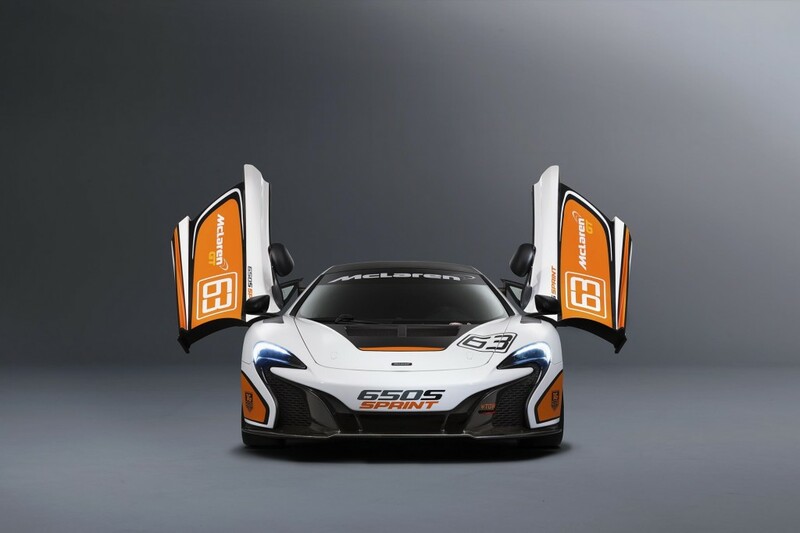 The first example of the McLaren 650S Sprint is shown with a new striking livery, in an inverted colour scheme of the 650S GT3 car shown at Goodwood Festival of Speed. Finished primarily in white, the design also features the new Tarocco Orange finish seen on the GT3, with subtle black and white detailing throughout. The 650S Sprint has a lower ride height with recalibrated adaptive damping for revised spring rates, and sits on 19-inch centre-locking racing wheels, fitted with Pirelli slick or wet tyres, while an onboard air jacking system enables quick tyre changes. Stopping power is also enhanced and provided by a race-prepared braking system developed for the 650S Sprint. This system combines with the road car’s highly effective Brake Steer system and enhanced active aerodynamics to offer superior braking performance. This allows for later braking into corners, but also improved brake feel and greater cornering speeds. A range of further options and upgrades are available including a CFD (computational fluid dynamics) developed aerodynamic package including carbon fibre rear wing and front splitter, a passenger seat with six-point harness, and further lightweight components including a polycarbonate windscreen. The 650S Sprint will be priced at £198,000*, and available from all official McLaren retailers worldwide or direct from McLaren GT. Visit retailers.mclaren.com to locate your nearest retailer.